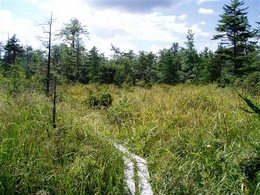 Constructed in 2005, this 1,100 foot wetland boardwalk trail at the Pocono Mountain West School Campus takes school students and the public through a rare bog formation…a flow-through bog. 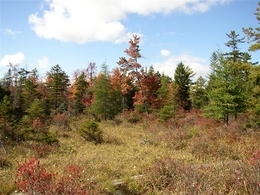 For more information on this bog and the plants which inhabit it, take a look at the curriculum which was created for use by high school teachers at Pocono Mountain West. To visit the wetlands, enter the school from either Sullivan Trail or Rt. 940. Follow signs to the Maintenance Building and park in the lot between the Maintenance Building and the running track. The trail begins across the street from the track along the edge of the forest. Look for the kiosk. For more than ten years, The Tobyhanna Creek/Tunkhannock Creek Watershed Association (TC/TCWA) and its volunteers in partnership with the Monroe Co. Conservation District have been sampling the Tunkhannock Creek, which is classified as a High Quality-Cold Water Fishery. Based on this data, TC/TCWA decided to seek a classification that matched the quality of the stream – Exceptional Value - in order to preserve that body of water’s quality. The samples collected by volunteers showed that the Tunkhannock scored very high on both chemical and biological tests year after year. It scored as high as other streams that are listed as Exceptional Value - Pennsylvania’s highest ranking. Further support was added by a detailed study of the Tunkhannock Creek watershed completed by The Nature Conservancy. It found that the Tunkhannock Creek watershed is unique in its pristine condition, plant and animal diversity and its vulnerability to degradation. Reclassifying a stream requires filing a fact-filled Petition with the Pennsylvania Environmental Quality Board for a change in designation. After discussing the proposal with Monroe and Carbon counties and the three townships involved, as well as with many different interest groups, the Watershed Association filed the Petition in March of 2005. The Petition was accepted for study at the June 21, 2005 Environmental Quality Board (EQB) meeting. DEP scientists have performed their own assessment of the stream and will make a recommendation to the Environmental Quality Board (EQB). We are awaiting the DEP recommendation. You can lend your support to the Petition by writing a letter to the Chair of the Environmental Quality Board, its members, or your legislators. 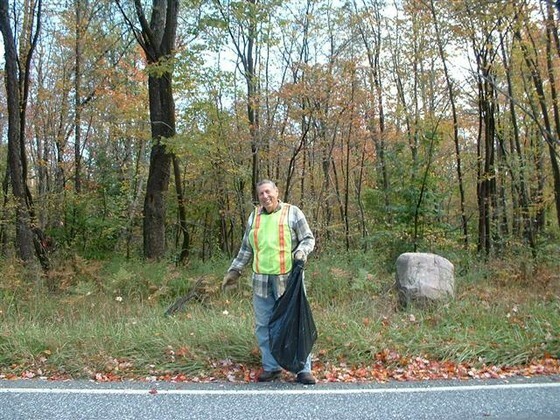 Every Spring and Fall we get together to pick up litter along our four-mile Adopt-A-Highway stretch of Rt. 423, north of Timber Trails. Check back in September and March for the announcement of the next clean up date. We’d happily accept any help. In an effort to raise awareness and to provide guidance on watershed protection, we have created a watershed placemat (PDF) to be distributed to local restaurants.